The institutions, ranging from large corporations such as General Motors Co.GM +1.24% to big universities such as Harvard, have been shifting to hedge funds, private equity and venture capital. But while these alternative investments outpaced stocks during 2008’s market meltdown and are seen as potentially less volatile, they have badly lagged behind the S&P 500 since 2009, a period in which U.S. stock indexes have more than doubled. Diversifying away from stocks could work out since many of these institutions enjoy long investment horizons and won’t need to spend the bulk of their assets until years in the future, if ever. At the same time, many alternative investments have topped stocks over the past decade. Investments in private equity, for example, nearly tripled the gains in stocks, according to Cambridge Associates LLC, which invests in these funds for clients. Missing out on recent stock gains, though, adds to challenges facing pension funds, some of which don’t have enough assets to meet future obligations. For universities dependent on endowment income, reducing stockholdings represents a lost opportunity in a time of stretched resources. The recent poor showing has put a spotlight on pension funds and endowments that have turned away from stocks for more than a decade, including the period after the market’s plunge, when stocks became inexpensive relative to their earnings. “Alternative asset classes are expensive, especially if you have to live with the average fund instead of stellar funds,” said Prof. William Goetzmann of the Yale School of Management. Hedge funds and private-equity firms generally charge investors much higher fees than mutual funds and other traditional investments, including management fees of as much as 2% of assets and a take of any returns. Harvard University, with the world’s largest endowment at $32.7 billion, had an average annual return of 10.5% over the past three years through June 2013, according to the school, well below returns of 18.45% for the S&P 500, including dividends, over that same period. Yale University, with an endowment of $20.8 billion, and Stanford University, $21.9 billion, had returns of 12.8% and 11.5%, respectively, over that same period, the schools said. Over the past 10 years, the schools fared better, generating gains of 9.4%, 11% and 10%, respectively, above the 7.3% return of the S&P 500. Spokesmen for the schools declined to comment. The U.S. companies with the largest defined-benefit pension plans in 2013 posted an average return of 9.9%, according to a survey of 100 large firms by Milliman, which provides actuarial products and services. The S&P 500 returned 32% in 2013, including dividends. The average college endowment had 16% of its investment portfolio in U.S. stocks as of the end of June 2013, the most recent academic year, according to a poll of 835 schools conducted by Commonfund, an organization that helps invest money for colleges. That is down from 23% in 2008 and 32% a decade ago. The 18% allocation to foreign stocks didn’t change in that period. Schools in the poll, which collectively manage nearly $450 billion, had 53% of their funds in alternative strategies, up from 33% in 2003. The average allocation of corporate pension funds to stocks was 43% at the end of last year, down from 61% at the end of 2003, according to J.P. Morgan ChaseJPM +1.11% & Co. The average public pension fund had 52% of its portfolio in stocks at the end of 2013, down from 61% at the end of 2003, J.P. Morgan said. While stockholdings have shrunk, alternative investments made up 25% of the portfolios of public pension funds, up from 10% a decade ago. 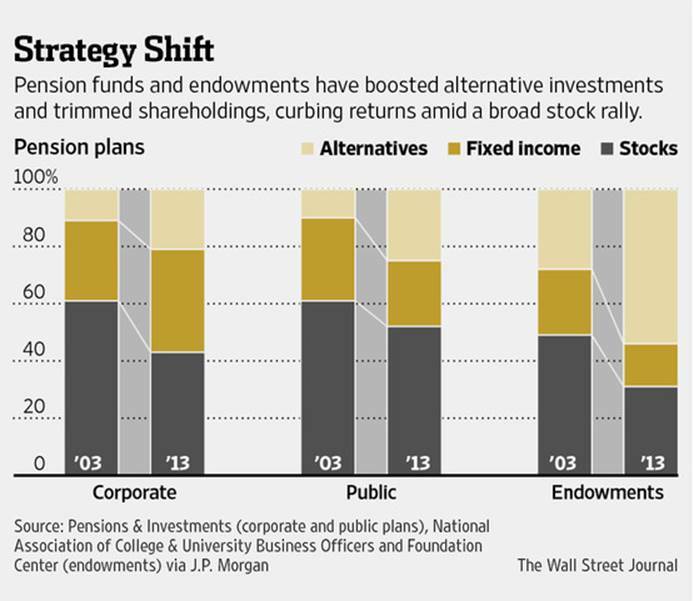 Corporate funds had 21% of their money in alternative investments, up from 11% at the end of 2003, J.P. Morgan said. Hedge funds and private-equity firms can use a range of strategies, including betting against stocks and buying and selling companies. The shifts haven’t worked out lately. Since the start of 2009, when the market began rallying, the S&P 500 has climbed 137%, including dividends, to record levels. By contrast, the average hedge fund is up 48%, according to research firm HFR Inc., while the average hedge fund that is focused on stocks has risen 57%. Over that same time, private-equity funds have climbed 109% on average, while venture-capital funds rose 81%, according to Cambridge Associates. Among large U.S. companies with small allocations to stocks in their pensions, shareholdings ranged from 5.2% at NCR Corp. NCR -0.06% to 14% at Prudential Financial Inc. PRU -0.64% and TRW Automotive Holdings Corp. TRW +1.31% to 15% at Ford Motor Co. F +1.26% to 18% at General Motors to 19% at CitigroupInc., C +1.52% as of the end of fiscal 2013, according to Milliman and data provided by the companies. A GM spokesman cited language in the company’s annual report that the asset mixes of GM’s pension fund aim to improve its funded positions while trying to reduce the plan’s risks. Spokesmen for NCR, Ford, and TRW declined to comment. Some pension funds have elected to have big bondholdings instead of shares or alternative investments. CBS Inc., CBS -0.07% which had 26% of its pension fund in stock as of last year, largely invests in bonds, according to a CBS spokesman. Some institutions aim to achieve a certain return above inflation and find steady returns from alternative-investment vehicles make it easier to plan future spending. Alternative investments generally do a better job competing with stocks when the risk of the various investments is taken into consideration. The long-term results of alternative investments are somewhat better. Over the past 10 years, the S&P 500 has climbed 114%, including dividends. That bests the 75% gain of the average hedge fund, according to HFR, and the 68% return of the average stock-focused fund. But private-equity funds topped stocks, rising 304% on average over that period, while venture-capital funds climbed 153%, according to Cambridge Associates. “It’s in the long term that these strategies hit their stride, particularly private equity,” said Andrea Auerbach, head of Cambridge’s global private investment research. Placing money with hedge funds once was viewed as risky; today, a mix of stocks, bonds and cash is seen as more dangerous, industry members said, partly because alternative investments held up better during the financial crisis and are seen as more dependable investments. Some argue that the shift stems at least partly from an effort to ape the strategy of David Swensen, who has long led the endowment of Yale University and was among the first to shift big chunks of its investments to hedge funds and similar vehicles. Harvard’s endowment had an allocation of 33% to global stocks and stock-focused hedge funds, but just 11% to U.S. shares, as of the fiscal year ended last June. Yale had 15.7% in global stocks and Stanford had a target stock allocation of 25%. Those shifting to alternative investments more recently could be “too late to the game,” said Scott Malpass, chief investment officer at the University of Notre Dame, which has had more than 50% of its $9.2 billion endowment in alternative investments for more than a decade. Betting on hedge funds and private equity “can be a knee-jerk reaction to the crisis,” he said.